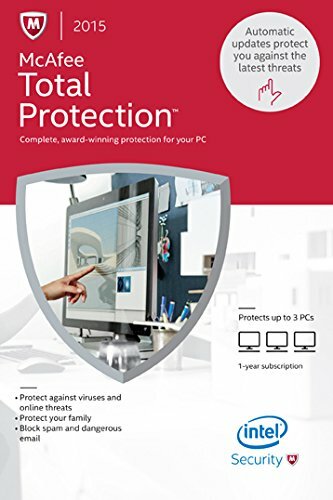 Award-Winning Anti-Virus Protection – McAfee Total Protection leverages the power and threat intelligence of more than 100 Million McAfee customers world-wide to identify, quarantine, and stop the latest threats from harming your PC. Parental Controls and Web Safety Tools – McAfee Total Protection includes Parental Controls and Web Safety Tools to help keep the entire family safe when using the computer. McAfee Total Protection, from Intel Security, provides complete award-winning security for your PC. Ideal for families with a Windows PC in need of one solution providing virus protection, parental controls, a spam filter, and the ability to secure sensitive files stored on the hard drive.At McAfee®, we live and breathe digital security, relentlessly working to stay several steps ahead of the latest online threats. Every second of every day we focus on one thing: keeping your digital life safe.